A state of war in south and southeast Afghanistan exacerbates already precarious living conditions for people in more than a third of the country. Public services are devastated and the vast majority of people have little or no access to essential health services. To reach the infectious disease ward of Kandahar hospital, for example, patients must travel great distances through highly insecure areas and often arrive too late: more than half of the deaths at the hospital, the only referral facility in the area, occur within 24 hours of admission. Aid programs to displaced people at risk of malnutrition in Zhare Dasht camp are insufficient and often interrupted. Basic emergency aid is not reaching those who need it in these areas because insecurity makes it nearly impossible to provide meaningful assistance. Anti-US forces have deliberately targeted aid workers, forcing many agencies to scale back the reach and level of their programs. Since January 2003, 25 aid workers have been killed in criminal attacks. MSF has had to withdraw its international staff from all areas except Kandahar, while its programs in Ghazni are run by national staff who are only marginally less at risk. 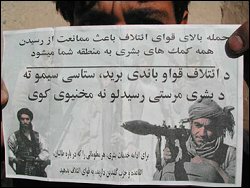 At the same time, leaflets distributed by the US-led coalition to people in war-torn southern and southeastern Afghanistan portray the delivery of aid as conditional on Afghans collaborating with the US military. As attacks on aid workers continue, such actions put all aid workers further at risk and undermine the possibility of providing much-needed assistance to Afghans most in need. In response to press inquiries, the Pentagon has stopped circulating these particular leaflets, but the episode raises several issues. One leaflet pictures an Afghan girl carrying a bag of wheat and reads: "In order to continue the humanitarian aid, pass on any information related to the Taliban, El Qaeda and Gulbaddin." Another leaflet reads: "Any attacks on coalition forces hinder humanitarian aid from reaching your areas." Threatening to withhold food, water and medical care unless Afghans gather military intelligence for the US military is far from humanitarian. Making assistance a tool of its military goals, the US contributes to suspicion and violence against aid workers, and puts all humanitarian aid workers in southern Afghanistan at risk. As a result, Afghans don't get the help they badly need, and those providing aid are further targeted for attack. Officials at the Pentagon said a mistake had been made by representatives at the local level and have assured groups that the mistake would not be repeated. The practice, though, was only the most recent episode of a dangerous pattern of the US co-opting humanitarian assistance since military operations began in Afghanistan. During the bombing campaign in October 2001, food packets were dropped alongside bombs, while US Special Forces have posed as aid workers on a number of occasions. Humanitarian organizations provide unconditional assistance to people in Afghanistan and elsewhere based on needs alone, regardless of political beliefs or relations with any military or political groups. Instead of subverting humanitarian assistance, the US-led coalition must respect the basic dignity and needs of ordinary people caught up in this violent crisis and therefore respect and enable independent, neutral and impartial humanitarian work and the safety and access of those trying to deliver it to people in need in Afghanistan.